A tiny group of Christians in a predominantly Moslem environment, determined to forge ties of friendship and dialogue in a society that still bears the wounds of thirty years of civil war. 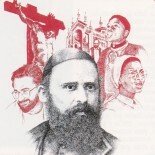 A Comboni Missionary community tells its story. Abéché town is on the doorstep of the desert in eastern Chad. Just l.1% are Christians, Catholics and Protestants, in a Moslem ocean and a score of Catholic communities spread out in six regions. 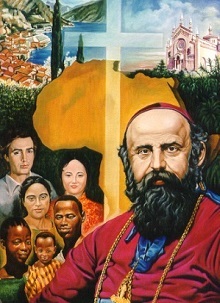 We are three Comboni priests: Father Bernard from the Democratic Republic of Congo, Father David from the United States, and Father Filippo, Italian. We assist a parish of over 400,000 square kilometres. The catholic community furthest to the north, Fada, in the Sahara desert, is 480 kilometres from the one furthest south, Tissi, a place well known in these parts as the meeting-point of three borders: Chad, Sudan and Central African Republic, as well as the tensions between the nomadic groups that move between them. Our territory is so vast that, even four years after our arrival, we are still discovering new places and, more importantly, new Christian communities. It takes days of travelling to reach the communities; endless kilometres and hours and hours of dirt roads that run between the Sahara desert and the Sahel, the strip of land that goes across the continent, separating it from Maghreb and Sub-Saharan Africa. Journeys are physically hard not only because of the jolting over rough roads but also due to repeatedly digging the jeep out of the sand or pushing it across rivers. When we reach our destination, we are hosted in the homes of the people or in a small room attached to the chapel with a sleeping bag for a bed. We drink tea seated on a mat and talk about life, the families and the community, dreams and disappointments. We organise meetings with the leaders to see the state of the community. We visit the people in their homes to be close to them. Without waiting for an invitation, we simply go to where the people live and soon gain their trust: a glass of water and then we get down to business. After that we pray with the family and continue our mission. All our Christians come from the south and just one small area of the Guera region to the north. None of the original people of this sacred Moslem land are Christian and we are not looking to convert them. We prefer to build bridges of friendship, encounter and collaboration. We are well aware that it is not just numbers that build up the Kingdom of God but the passion and the dreams that, together we have within us as we work among various ethnic groups, cultures and religions. Among our Christians we find teachers, nurses, doctors, soldiers and students as well as many businessmen. They spend a few years with us and then leave. In an effort to ensure the continuity of our service, we have learned to work as a team. If anyone leaves, others take over the work. On our part, we are often tempted not to be fully committed since we never know how long we can stay. Consequently, we take the opportunity to transmit the message that we are called to give ourselves with passion and without reserve. The fruits ripen when we listen and really commit ourselves: some become catechists or trainers of the youth, others take care of the sick and the imprisoned while others cultivate the community field, act as librarians or prepare the food for meetings, courses or celebrations. We first came to Abéché in September 2013 with Father Abakar, a Comboni priest from South Sudan, to build a bridge across the Moslem ocean and journey together with our small Christian communities. We give one hand to the Moslems, the other to the Christians; like grains of millet called to become salt to the earth and light to the world, bearing the still-open wounds of thirty years of hatred and war. Within this humanity pierced to the heart and divided between Islam and the West, we try to proceed with hope, building bridges of encounter and collaboration. We have schools and cultural centres run together by Christians and Moslems, literacy classes for women and girls of all ethnic groups and religions, small income-generating projects like sewing, an oil press and a restaurant. Above all, we have friendly and respectful dialogue with our neighbours and collaborators, meetings with religious authorities on festive occasions and the celebration of peaceful cohabitation between young Christians and Moslems. All of this is possible when the Christian communities are accompanied and encouraged to see the interreligious encounter as an opportunity for growth and development, both of the individual and of the community. It also requires confidence in God: confidence and the prayer of others that moves us to pray. This is why we give ourselves to reaching the Christian communities no matter where they are and helping to train their leaders. When they are well trained and accompanied, lay people will carry out wonderful work of catechesis, liturgy, the formation of the youth, schools, cultural centres, justice and peace committees and dialogue with Islam. When we came here in 2013, we very carefully started to get to know what God had done through the Jesuit missionaries who had been there for the past 60 years, and especially through the lay people who, in very difficult places, live out their confidence in God and organise themselves into vivacious and courageous communities. All of them need to be visited and supported so as to feel part of a family. Despite the distances and the desert, we are the people of God on a journey, faced with the great challenge of taking in hand our Church at all levels. It is the lay people who organise the communities through meetings and groups of leaders. It is they who organise Sunday prayer and, in some communities, daily prayer. They follow up the youth and the elderly who wish to become Christians, they direct the choirs and readers. Importantly, they collect funds to build chapels and fences, to bring water to difficult places or to build huts for community schools. They also try very hard to support us missionaries who have been sent to them. Each community contributes its quota to help with fuel for our jeep. We may say that, little by little, with pride and dignity, our Christians are meeting the needs of their missionaries. They are also very happy to support their communities. In the past, things were brought from outside and this created beggars. Now, much is provided from within and the people are proud of this and stand on their own two feet. This was how Jesus of Nazareth worked. Our communities are not composed of people who just stand around like spectators; the Justice and Peace Committee of Abéché is doing everything it can to restore dignity to the young child-shepherds who look after flocks of goats, camels and cows in the desert. These are the slaves of the 21st century, stolen from their families in the south to provide prestige to the powerful in a country where those with the biggest herds are most important among the people. In Chad, we had traffickers of children and migrants going to Libya arrested. We watch the slave routes and rescue children who escape from their tormentors and restore them to their families. We organise awareness meetings and endeavour to let people know their rights. Caritas has taken over the service of prayer and accompaniment for prisoners and families in greatest difficulty, the small income-generating projects and the literacy classes for women. We want to accompany the disabled meet their thirst and search for dignity. In all this we have at heart the dream of lending a hand to the fallen, to help them to their feet again. The Rewnodji women (the good journey women) have organised a bank of cereal seeds to respond to the times of drought and also a course of professional training for the youth: information technology, electricity and hydraulics. In this way, in eastern Chad the Gospel sits well with the accompaniment of small Christian communities and the encounter with Islam. It is a matter of faces and stories of people who truly want to turn a new page, leaving behind war and divisions to open a new era of peaceful co-existence: the true challenge to Chad both now and for the future. The longer we stay here, the more we feel we have reached the heart of the people. We feel we are within the heartbeat of a people longing for peace at last, for justice and liberty; a people who have understood that these goals will be reached only by turning our gaze towards the one God. It matters little whether we pray to Him like Jesus or like Mohammed. Questa voce è stata pubblicata il 13/06/2018 da MJ in ENGLISH, Vocation and Mission con tag Africa, Chad, Mission, Testimony.